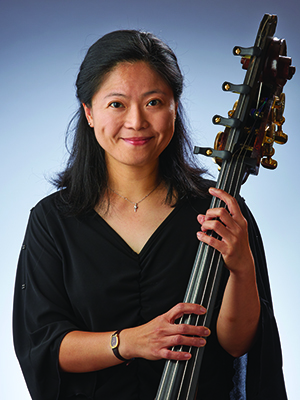 Ju-Fang Liu was appointed Principal Bass of the Indianapolis Symphony Orchestra by Maestro Mario Venzago in 2003, shortly after receiving her bachelor and master's degrees in double bass performance from Indiana University. There she studied with notable bass pedagogues Bruce Bransby and Larry Hurst. In addition, she has worked with other internationally-known teachers such as Edwin Barker, Edger Meyer, Harold Robinson, Stuart Stankey, Lawrence Wolf and Tim Cobb. Ms. Liu’s musical interests encompass all aspects of musical performance. She was a repeat performer in the world-renowned Marlboro Music Festival working with the top chamber music professionals of our time as well as performing in the Aspen and Tanglewood Music Festivals. A sensitive and thoughtful performer, she is constantly in demand in Indianapolis’ various chamber music venues. Ju-Fang has been a finalist for the Boston Symphony as well as for the Atlanta Symphony Principal position in 2014, and has appeared with the Chicago Symphony. In addition, she has performed as co-principal with the New World Symphony. Her solo concerto performances have included the Bottesini, Koussevitzky and Tubin concerti, the latter performed under the baton of Maestro Venzago. She is also the first performer to win both the Solo and Orchestral Categories (Adult/Professional) of the International Society of Bassists competitions. Ju-Fang has always had a serious interest in teaching and pedagogy and has previously taught at DePauw University and Indiana University. She joined the faculty of the Butler University School of Music in Indianapolis in 2014. Ms. Liu has given master classes in Columbia, working with the Filarmónica Joven de Colombia and has been a guest artist at the Taipei National School of the Arts and the Beijing Central Conservatory and other conservatories in China and Taiwan, performing recitals and giving classes. Always seeking to improve her musical scope, Ju-Fang was awarded a Creative Renewal Grant from the Arts Council of Indianapolis and has added the electric bass and jazz study to her resume. Her solo cd is available at http://www.cdbaby.com/cd/JuFangLiu.